HOME - FAMOUS SPEECHES IN HISTORY - ON THE DEATH OF MARTIN LUTHER KING JR.
On the Death of Martin Luther King Jr.
Go here for more about Robert F. Kennedy. Go here for more about Kennedy's Speech On the Death of MLK. 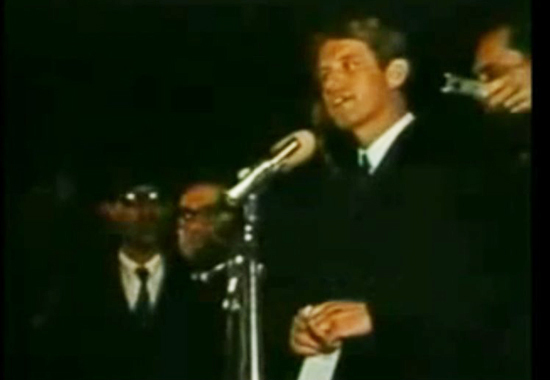 Video clip - Bobby Kennedy announcing the death of Martin Luther King, Jr. Scroll down for the text transcript. It follows the full text transcript of Robert F. Kennedy's speech on the death of Martin Luther King, Jr., delivered at Indianapolis, Indiana - April 4, 1968. I’m only going to talk to you just for a minute or so this evening. Because... I have some very sad news for all of you, and I think sad news for all of our fellow citizens, and people who love peace all over the world, and that is that Martin Luther King was shot and was killed tonight in Memphis, Tennessee. Martin Luther King dedicated his life to love and to justice between fellow human beings. He died in the cause of that effort. In this difficult day, in this difficult time for the United States, it’s perhaps well to ask what kind of a nation we are and what direction we want to move in. the awful grace of God." So I ask you tonight to return home, to say a prayer for the family of Martin Luther King, yeah that’s true, but more importantly to say a prayer for our own country, which all of us love - a prayer for understanding and that compassion of which I spoke. We can do well in this country. We will have difficult times. We’ve had difficult times in the past. And we will have difficult times in the future. It is not the end of violence; it is not the end of lawlessness; and it’s not the end of disorder. But the vast majority of white people and the vast majority of black people in this country want to improve the quality of our life, and want justice for all human beings that abide in our land.